In 2015 I was asked to work with Canon David Holgate and the Dean Rogers Governder to source and install a Lenten art work at Manchester Cathedral. We were delighted to to find the work of a local, classical trained artist who was working on a series of life size portraits some of which had strong religious meanings. 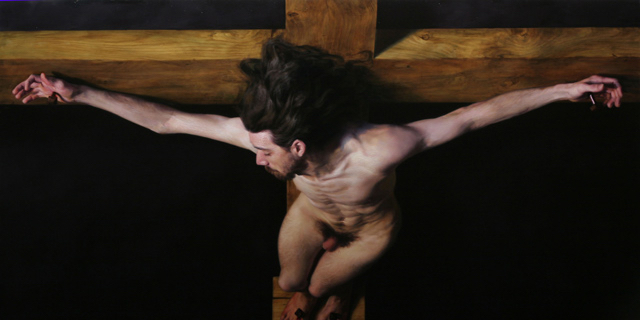 This stunning oil painting is a life size realist depiction of the Good Thief who according to the Passion story was crucified to the right of Christ at Golgotha. It is unusual to depict the crucifixion story without making Christ the central figure, but in this image we are invited to see ourselves in the place of this penitent man who, like Jesus, is suffering a most painful and humiliating death and yet chooses, at this most terrible time, to turn his face towards Christ and ask to be remembered. History teaches us that the Romans would strip naked those whom they crucified in order to increase their humiliation. In most images Jesus is portrayed wearing a loin cloth so as not to cause any offence but here the artist has chosen to be realistic both in his painting style and in the way he has depicted the thief. Crucifixion was a slow, gruesome and public death and this representation beautifully captures the moment when the thief to the right of Christ turns his head and speaks to Jesus. Eyes looking down in remorse and shame, St Dismas, as tradition names him, is a broken and tortured man. Arms nailed outstretched to the heavy wooden cross, he is completely exposed, both physically and spiritually, unable to run away from his past anymore. In the bible verses we read that there were two criminals who were crucified either side of Jesus. The one on the left continued to hurl insults and abuse at Christ, mocking him and telling him to physically save them if he really was the Messiah. Unable to let go of his anger and obvious suffering this man continued to transfer his pain and anger onto another. However the story we see in this painting is the response of the second thief, suffering the same punishment, he chose to let go of his anger, to stop fighting within himself and to instead turn towards God and ask to be remembered, included in the kingdom that was to come. This painting is about hope, about grace and unconditional love; that none of us are beyond the reach of the eternal love of God. The artist has chosen not to paint this scene from the perspective of one of the crowd as is usually seen, borrowed from a painting by Salvador Dali “Christ of St John of the Cross” the scene is instead depicted from the perspective of God above, looking down on Calvary and seeing the heart of the penitent thief as he makes his peace with Him. Each of us carry within us the responses of both of those crucified with Christ. We each have a choice to make as to how we will choose to live and die. Will we remain the angry victim who continues to pass on our hurts to everyone who crosses our path, to spit out angry words, aggressive behavior, and cynical thoughts and allow bitterness to shape our inner being. Or will we choose the harder path, the way of letting go, of giving room for the flow of God’s everlasting compassion, love and forgiveness to heal our wounds and our heartache. Will we seek the help and the comfort that we need or will we continue to fight on alone. Will we turn our face towards the wounded Christ and ask Him to remember us? Take a few moments to sit quietly with this painting and allow its message to seep deep into your soul. You may want to respond with a prayer, by lighting a candle or by writing your thoughts in the Lent Installation book by the side of the painting. But above all this Easter time, know that God looks deep into our hearts and see’s us as we are, He forgives us, loves us, heals us and welcomes us into His kingdom. Manchester based artist Louis Smith is a classically trained portrait painter who studied in Florence for three years after his BA Hons degree in Fine Art at Sheffield University. He was shortlisted by Threadneedle Prize in 2009 and was awarded 2nd prize for the BP Portrait Award in 2011.